Human smugglers abandoned a pair of illegal immigrants in the sweltering heat of the southern California desert and left them to die. Border Patrol agents were unable to save the life of one man after he collapsed. El Centro Sector Border Patrol agents spotted a man walking along State Highway 98 on July 6 at about 4:30 in the afternoon. The man admitted to being smuggled across the border and said that he and his cousin were abandoned and left to fend for themselves. The foreign national said his cousin was in “dire need of medical assistance,” according to U.S. Customs and Border Protection officials. Temperatures in the area on July 6 reached a high of 113 degrees. At that level, it almost becomes impossible to carry enough water to sustain a march through the desert. 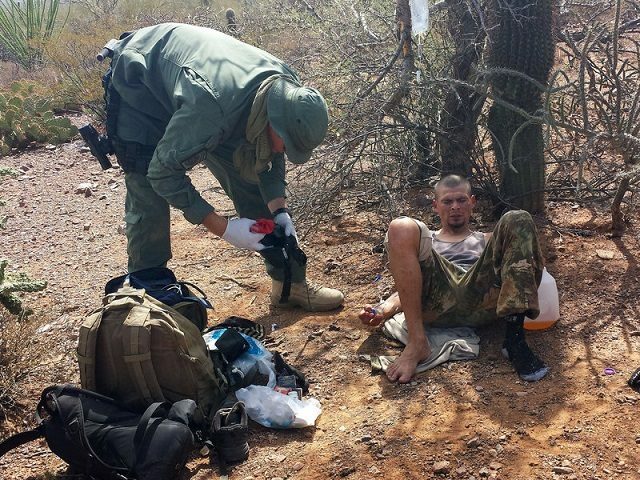 Border Patrol agents quickly mounted a search and rescue operation. They found the distressed migrant about 15 minutes later, officials stated. The agents promptly provided first aid for the victim and called for emergency medical assistance. Local first responders rushed to the scene and treated the man who had by then become unconscious from heat-related reactions. The emergency medical personnel were unable to revive the man who was pronounced dead at the scene. At least 142 migrants have died after illegally crossing the U.S.-Mexico Border this year, according to the Missing Migrant Project.